Discover weight loss secrets and the keys to a healthy lifestyle in a painless way while enjoying a luxurious week in Texas. Do you have "love-handles" that you don't want anymore? Have you tried every weight loss program out there, but realize it's time to get serious? Do you have a daughter or a friend you would like to partner with in your health journey? Do you want to eat healthy foods and be more active, but you feel total overwhelm? Take a deep breath. I know you have probably tried every diet and weight-loss plan out there. Come and immerse yourself in a luxury spa-like atmosphere for 5-full-days while you learn the components of a healthy lifestyle and get off to a running start towards all of your health goals. With a coach by your side in-person for 5 full days, you will be gently guided through a proven process that is guaranteed to support you in changing your past unhealthy behaviors. Learn the "how" and "why" of a healthy lifestyle. How to get back that trim, energetic you and release those feelings of frustration and overwhelm. 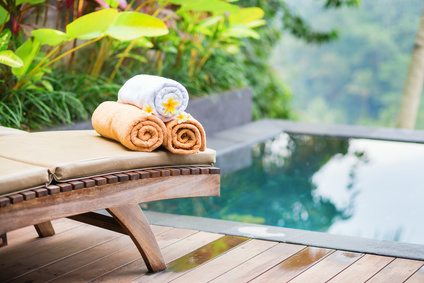 Tips and tricks for taking this new lifestyle back to your "real" life at the end of your Spa week. Five daily sessions (8:00 am - 7:00 pm) in a luxury spa-like atmosphere in Tyler, Texas. A 30-minute call prior to your Spa week to answer any questions. A series of lab tests (a lipid panel) done (through healthtestingcenters.com) before you arrive. An in-depth health assessment on Day 1 to determine your current state of health. In-person coaching sessions to discuss your lab results and to develop your health and lifestyle plan for the upcoming months. Worksheets, templates and recipes to reference and support you. Two 30-minute follow-up calls within 30 days after your VIP Spa Week, to make sure you get the accountability and support you need to implement all that we covered during your week. BONUS: A 3-ring binder, non-glare sheet protectors and a package of oversized, insertable dividers so you can keep your menus, recipes and hand-outs in one location. BONUS: A one-hour session with a professional physical trainer to set your exercise goals during your week. BONUS: A one-hour full body massage at the local SPA during your week. BONUS: A professional mani/pedi during your week. BONUS: A professional hair styling during your week. BONUS: A professional make-up application during your week. BONUS: A professional photography session during your week. BONUS: Bring a friend with you for 1/2 price. To start with a "get-acquainted phone call," click here to schedule. To start with a "get-acquainted" phone call, click here to schedule.